Sometime in the late 1920s, Sarah Eva Howe's aunt Louisiana Winslow Howe took it upon herself to respond to a question printed in her local newspaper, the Carrollton Democrat. The question: "How many Methodist churches have there been in Carrollton?" Lou's answer wasn't just a number. She wrote an article more than 1,000 word in length! Today I post a transcription of that article, not because I think all of you are eager to know the history of Methodism in Carrollton but because Lou includes stories and names. Lots of names. We know from other written histories that she was not always on target with dates, but that doesn't diminish the value of her article to those seeking ancestors and stories. Genealogists and historians with Carroll County roots, this post is for you. Forasmuch as the publishers are anxious to have a response to the query propounded a short time ago in the Carrollton Democrat, “How many Methodist churches have there been in Carrollton?” yielding to their urgent request I have examined some old papers and have discovered a pamphlet, designated as the “Methodist Church Directory,” prepared and distributed among the membership in 1898. It would be gratifying to learn if other copies have been preserved. For the information and enlightenment of those who may be interested, I have agreed to furnish for publication, at the present time, the following paragraphs. 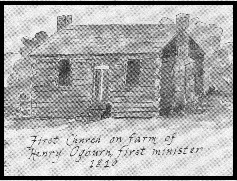 In 17_ _  the Reverend Henry Ogburn, a preacher of the Methodist church, came with his wife and family from Virginia to this State. 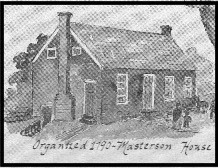 He frequently preached at his own residence, the stone house with a flat roof, south of the Ghent road, on the north side of what is known as Ogburn’s Hill, and also at the home of Richard Masterson, near the bank of the Ohio river, about a mile from our corporation limit: the house is now owned by R.W. O’Neal and occupied by John Hewitt. It was in that house in 1817 that Louisiana Winslow  , then eleven years of age (afterwards Mrs. Henry Moore), joined the Methodist church, remaining an active member and consistent Christian until she was called to the church triumphant in 1882. A log house, weatherboarded, on Sixth street, facing west, about half way between Seminary and Clay streets, was used as a place for worship during several years subsequent to 1820. It is possible that these constituted the total membership at that date, although there may have been other classes; the colored women whose names are appended were no doubt worthy slaves belonging to some of the white members. Jonathan Stamper was presiding elder; James P. Milligan pastor, and James H. Ross, associate pastor; the church in this locality was one appointment of Licking circuit, probably embracing the country between the Kentucky and Licking Rivers. It will doubtless be interesting to many of our people, as well as to some now connected with other denominations, to examine the foregoing list with the purpose of discovering how many may claim relationship with this Methodist ancestry. Sarah Bullock, fourteenth on the list, was married a short time afterward to the preacher, James Milligan, who only lived a few months, when she was again married to George W. Boorom and lived for many years in Carrollton. The remains of this honored couple are interred in the burying ground south of the present Methodist church. The brick edifice on High street was occupied regularly for Sunday school in the summer at eight and in the winter at eight thirty in the morning, preaching at eleven a.m. and seven p.m. on Sunday, and for prayer meeting on Thursday evening. These services were continued without interruption all through the years of the war between the States, though many other churches closed their doors. The last sermon within its walls was preached the first Sunday in July, 1870, by Bishop Hubbard Hindle Kavanaugh, who had come to Carrollton to baptize his namesake, the oldest son of the pastor, Rev. E.L. Southgate. The following week the building was torn down and replaced by the present structure (standing on the same lot), which was dedicated on December 25, 1870, and is now being remodeled. The ground was donated by William Winslow, who had moved from Virginia to the town of Port William, in what was then Gallatin County, in 1804. Some years ago a careful investigation was made of the old Quarterly Conference records which had been kept by William Beverly Winslow. He had been selected recording secretary in 1835, when he was 21 years old, and filled the position almost continuously in the years that followed until he was called to his eternal home in 1883. By reference to the first entry made in the record, beginning with 1835, it was ascertained that Rev. H.S. Duke was presiding elder and Rev. J.C. Harrison, circuit preacher. The first Quarterly Conference for the Conference year was held at Owenton, showing that Port William and Owenton were two appointments of what was then Port William circuit. On that occasion January 23, 1836, Thomas C. Cropper was granted license to preach. At the next Quarterly Conference April 10, 1836, Rev. William McD. Abbott was licensed to preach. In after years this good man served a number of stations in the Kentucky Conference, also was presiding elder on the Shelbyville and Covington districts, and in 1880 returned to Carrollton, a superannuated preacher, where be bought a home in which he lived until his peaceful transition . . . Apparently, the article continued on another page of the newspaper, but I have not found it in the scrapbooks. I did find a follow-up article, also written by L.W. (Mrs. W.F.) Howe. I'll feature that article in the next blog post. The numbers are unreadable in Sarah's scrapbook. 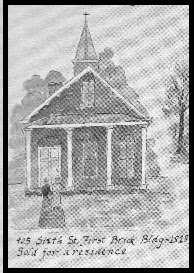 On Page 164 of The Encyclopedia of Northern Kentucky by Paul A. Tenkotte and James C. Claypool (via Google Books), a segment on Carrollton United Methodist Church states that Henry Ogburn began holding services in Carrollton in the 1790s and in 1799 performed the first marriage service conducted in Carrollton. The bride was Mary Pickett; the groom was Nicholas Lantz. Likely a family member for whom Aunt Lou was named. A grave marker in the Carrollton Methodist Church Cemetery says Louisa, born 1806, died 1882. The paper is torn, and the rest of this name is missing. Other writings on church history list this name as Kitty. 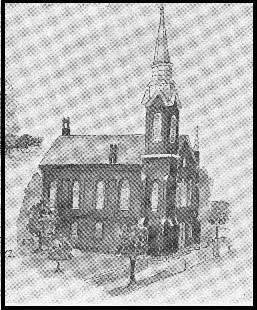 Images do not appear with the article but are published on the cover of a booklet on the history of Carrollton (Kentucky) United Methodist Church. Used here with permission. A history compiled by the church indicates that the church was built in 1818 and sold in 1830 to raise funds to build another church. The congregation met in the county court house until the new church was completed in 1833. Bits & Pieces is a continuing series of posts containing scrapbook snippets that have great info but are too short for stand-alone posts. Some of these small items are too good to leave behind. Just reading this pleasant, lilting verse is relaxing! I found this in one of Sarah's earliest scrapbooks. The reference to "in this pleasant room" makes me think it would make a welcoming and decorative piece for a guest bedroom. One web site attributes the poet to Victor Hugo (1802-1885); another site disputes that. 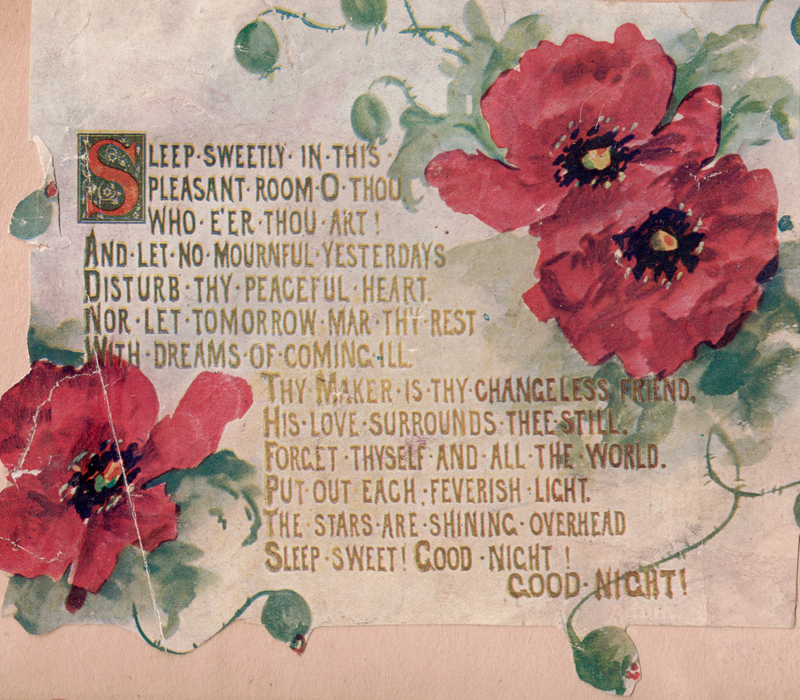 When world-renowned biochemist Roger J. Williams was traveling, he saw the poem on the wall of a bedroom in which he stayed. He memorized it and recited it to himself nightly His assistant read it at his funeral in 1988. 2. News Flash! Teachers Refuse Order to Wear Longer Skirts! When the Hazel Park, Michigan, school board decreed that teachers wear skirts no shorter than 10 inches above the floor, the teachers protested with a unanimous NO! Women on the school board argued that the "smock measure" (so called because teachers could opt to wear long smocks over their shorter skirts) was necessary to "protect the moral integrity of the youth of Hazel Park." The local PTA supported the teachers. The issue got publicity in papers near and far, so I was able to date the battle to late September/early October 1927. I'm intrigued that Sarah posted this newspaper clipping in her scrapbooks. Maybe there was a similar issue in her local schools. I don't know which side won, but my bet is on the teachers. 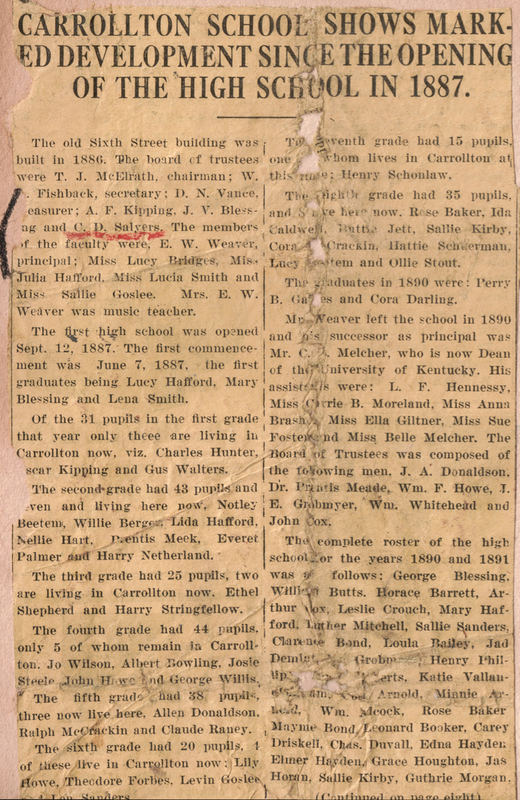 Continuing with the "schools" theme, here's a clipping about the students and faculty of Carrollton, Kentucky, high school from the opening of the school in 1887 to the early 1890s. I found the continuation of the article a month after posting this. The crayon marks are something only a Salyers could love. James R. Salyers, a son of the scrapbooker Sarah Eva Howe Salyers, saved lots of clippings, and he marked almost every one of them with crayons. (Check out the Salyers surname and Carroll County files in the Kentucky Historical Society library in Frankfort.) In this clipping, he underlined the name of his paternal grandfather. The black line draws the eye to a paragraph that includes the names of several relatives and friends. The final paragraph lists the roster for 1890 and 1891. What a gold mine for researchers trying to attach their relatives to a time and place! Below are the surnames that appear in the article. Unfortunately, the article's condition make some names impossible to read. Fishback, Vance, Kipping, Blessing, Salyers, Weaver, Bridges, Hafford, Smith, Goslee, Hunter, Walters, Beetem, Bergen, Hart, Meek, Palmer, Netherland, Shepherd, Stringfellow, Wilson, Bowling, Steele, Howe, Willis, Donaldson, McCrackin, Raney, Forbes, Sanders, Baker, Caldwell, Jett, Kirby, Schuerman, ?? ?tem, Stout, Ga? ?es, Darling, Melcher, Hennessy, Moreland, Brash? ?, Giltner, Foster, Meade, Grobmyer, Whitehead, Cox, Butts, Barrett, Crouch, Mitchell, Bond, Bailey, Dem? ?, Phillips, Roberts, Vallan?? ?, Arnold, Adcock, Booker, Driskell, Duvall, Hayden, Goughton, Horan, Morgan, . . . The continuation of this article includes these students of 1890-91: Clarence Nugent, Amelia Pryor, Otis Steele, C??? Wilson, Gideon Wood, Cora McCracken (misspelled CcCracken), Bennie Cox. 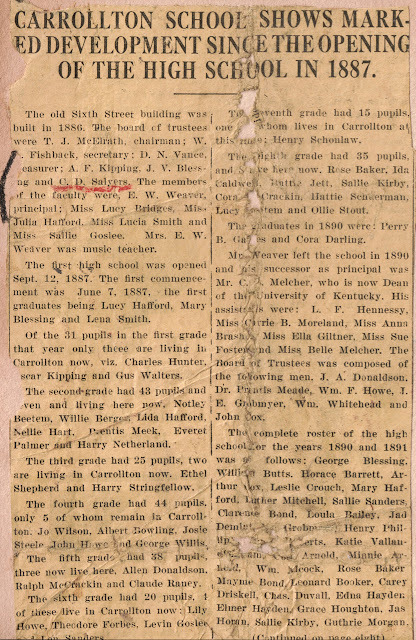 It also includes the names of Carrollton school system faculty members up to 1917-18. The Howe and Cost families of Cincinnati appreciated fine music. Many of the girls and women in both families played piano in their homes, in recitals, and at church. I think this warranty certificate, dated 1903, may represent the Howe family's purchase of Baldwin piano #7590. Leonora Alice Howe turned 7 years old that year, a perfect age to begin learning. 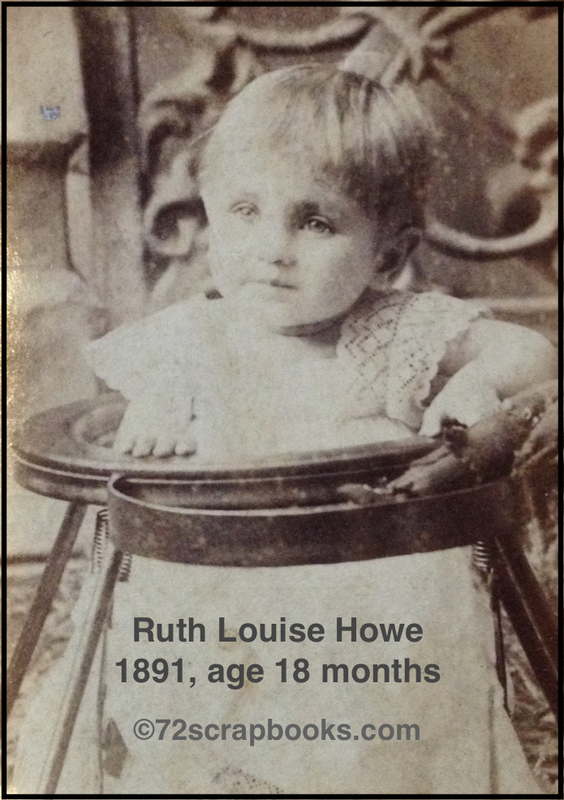 She showed musical promise, so I can imagine her parents, Robert James Howe and Alice Ada Cost Howe, supporting her early talent. Their support was rewarded. 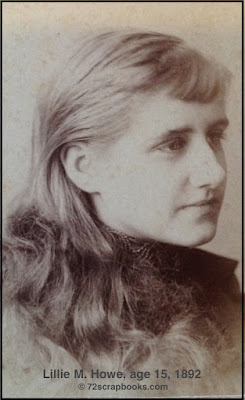 Leonora became a sought-after piano soloist, accompanist, and teacher. 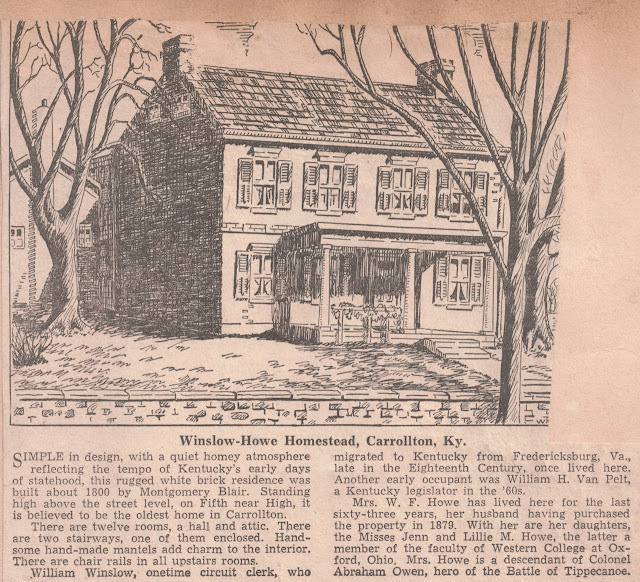 This was the Carrollton, Kentucky home of Will and Sarah Howe Salyers and their children. Their youngest child was born here in 1915. Maybe the others were born in this house, too. In the buggy, there are two babies. (That is difficult to see, but I found a notation to that effect.) This helps date the photo to 1910. Twins James R. and Mary Alice Salyers were born in April of that year. The person standing in the doorway is Sarah Eva Howe Salyers. Wearing the shorter dress is Sarah's 13-year-old sister, Leonora Alice Howe. The woman in the long dress is apparently one of their cousins. All of the dresses are dark, perhaps black. They could be mourning clothes. Sarah's maternal grandfather Richard Henry Cost died in July 1910. The best way to begin the story of Sarah's father's brother William – the first-born son of John and Sarah Brown Howe – is to start at the end. This obituary appeared in the Madison (Indiana) Weekly Herald on June 1, 1916. The photo is in one of Sarah's scrapbooks. Carrollton, Ky., May 22 – William Ficklin Howe died suddenly this afternoon. He attended the Methodist Sunday school yesterday, taught his class of young men and was in his pew at the morning and evening services. He had been in declining health for more than a year. Mr. Howe was born in Ireland April 18, 1846, and came to Kentucky with his parents, the late John Howe and Mrs. Sarah Howe when 2 years old. For many years he was in the banking and mercantile business with his father under the firm name of John Howe & Son. Later he developed the wool industry in this county and was largely engaged in the manufacture of woolen suitings. After the death of his father the store was reorganized, the firm name being Howe Bros., and Mr. Howe was made secretary and treasurer, which position he held at the time of his death. In all the movements for the betterment of Carrollton he was an active worker and gave freely of his time and means to every call. 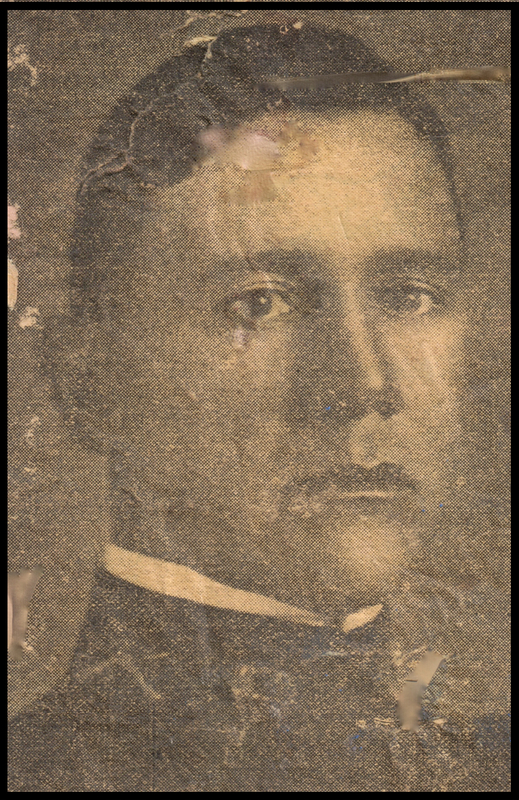 He is survived by his widow, Mrs. Lou Winslow Howe, and five children: John J. Howe, Commonwealth's Attorney for this district; Beverly W. Howe, a lawyer of Chicago; Miss Lillie Howe, who is now in Havana, Cuba; Miss Jennie Howe and Mrs. Henry Berg Schuerman, of Carrollton; a brother, Joseph B. Howe, and a sister, Mrs. J. M. Froman. The obituary makes no mention of William's service on the Carrollton City Council or his term as Carroll County treasurer, but those roles are mentioned on Page 238 of History of Kentucky by Connelley and Coulter, accessible on Google Books. Today, let's get to know a little about his wife and children. Lou grew up with eight siblings: Henry, James, Mariam, Jennie, William B., Ruth, George, and Pierce. Of the five brothers, three (Henry, William B., and George B.) followed in their father's footsteps; all became influential attorneys – Henry in Tennessee, William in New York City, and George in practice with his father in Carrollton. Lou's sister Mariam married a banker who held interest in a manufacturing plant. I'm still looking for information about James, Pierce, and Ruth, and all I know so far about Jennie is her husband's name: W.W. Martin. Lou married William in Carrollton on 8 October 1873. I know of six children born to them – sons Winslow B., Beverly Winslow, and John J., and daughters Lille M., Jenne Winslow, and Ruth Louise. Note the determination to bequeath the locally prominent name of Winslow to so many children in this family. Lou was an avid reader and a leader in the Carrollton Methodist Episcopal Church. 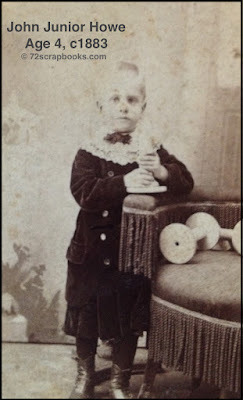 Winslow was born 9 October 1875 in Kentucky (likely in Carrollton) and died 30 July 1882 at the age of 6. Because he died before Sarah was born, she has (so far) said little about him in the scrapbooks. My speculation: The middle initial B may stand for Brown, the maiden name of his paternal grandmother. Mr. English got in touch with Cousin Lille Howe, then just nineteen (in Nov. 1896), who had graduated the year before from Science Hill School — then, as for many years, the outstanding girls’ school in Kentucky, a preparatory for Wellesley, and very thorough as to English literature and history, as well as Mathematics and languages, tho really only a very advanced High School; for Lille went immediately there without attending C.H.S. at all. 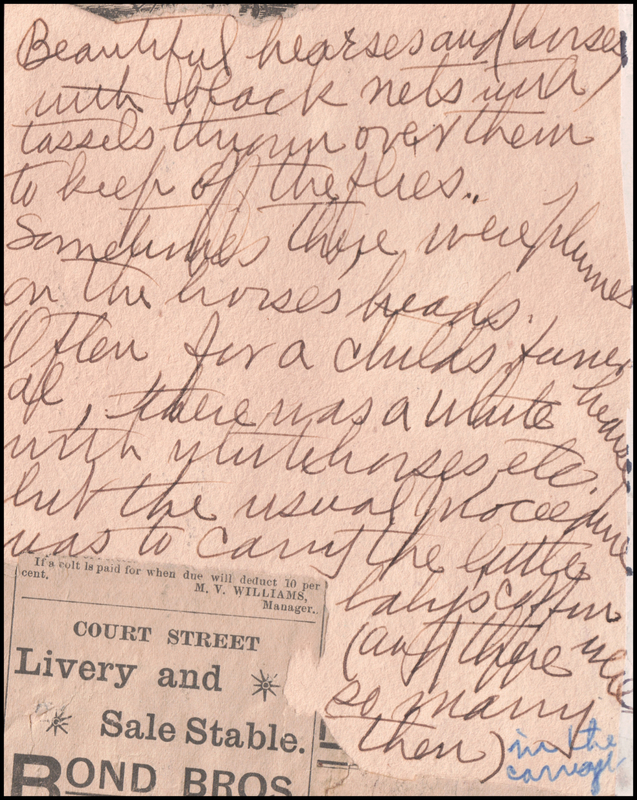 The scrapbooks also include notes about Lille working at times as a cashier in Howe Brothers department store, which was owned by her father and uncles. Lille must have had additional schooling (maybe at Wellesley? ), because she later taught Spanish at Western College for Women, now part of Miami (Ohio) University, not far across the river from Carrollton. Maybe her travel to other countries – especially Cuba – was prompted by her profession as a Spanish teacher, or maybe it was her enthusiastic participation in church mission projects. John, born 5 November 1879, was the namesake of his paternal grandfather. ("Junior" could indicate that a child was named for an ancestor other than his father. This family made it a middle name.) He was four years older than his cousin Sarah, whose admiration of him shines through in references to him in her scrapbooks. After high school graduation in Carrollton in 1896, John attended Kentucky Wesleyan College, a school affiliated with the Methodist Church. That's not a surprising choice, considering his family's roots and leadership roles in Methodism. John earned bachelor's and master's degrees at Wesleyan and in 1909 received a law degree from the University of Michigan. He held public offices ranging from Carrollton city cashier to commonwealth's attorney. He sought nomination as Kentucky's candidate for the U.S. Senate but lost that election. John Junior Howe was active in law, banking, church, and community until he died 29 July 1939 at the age of 59. Jenne was born in 1883, the same year as Sarah. Because Sarah had no siblings until 1896, other than a brother who died in infancy, she and Jenn were especially close as cousins. Another post has a photo and more information about Jenne. Yet another attorney in the family! Beverly Winslow Howe, whose name reflects those of his father, his maternal grandfather, a great-grandfather, and an uncle, was born 18 November 1885. 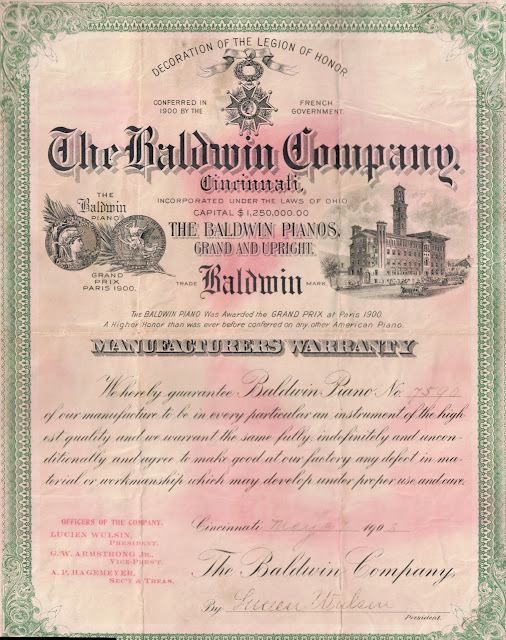 By 1908 he had been admitted to the bar in Tennessee and in Kentucky and was practicing law with his uncle and his brother in the firm of Winslow & Howe in Carrollton. In 1910 he moved to Chicago to work as a law clerk for a railroad company. He rose to prominence in his profession. In 1916 he married Chicago-born Ruth Goessele. (I wonder if that name is connected with the Goslee family of Carrollton?) They had two daughters, Louise and Isabell. Ruth (c1890 - 1930) was the last child born to William and Lou. She graduated in 1912 from Wellesley College, a private liberal-arts college for women, located near Boston, Massachusetts. Ruth and Henry had one child, a daughter they named Wilhelmina, born 4 March 1916. Like her mother, Wilhelmina was a graduate of Wellesley (Class of 1937). She married Prescott L. Kettell and remained in Boston, where she worked as a medical social worker at Massachusetts General. She retired in 1989 and died in 2007. According to her online obituary, Wilhelmina – like her Howe ancestors – was devoted to music, theater, and reading. The couple gave Ruth and Henry three grandsons: Russell W. of San Francisco; Charles W. of Durham, Maine; and Henry S. of Boston. When I look at Ruth Howe Schuerman's sweet baby face, I'm especially sad that she died so young – 29 November 1930 – at the age of 39 or 40. The cause of death was a skull fracture she suffered in an auto accident near Campbellsburg, Kentucky. She died in a Louisville hospital a day or two after the accident. In a scrapbook is this article about the house in which the William F. Howe family lived. (It was published in the Carrollton Democrat between July 1939 and 1942.) William purchased it in 1879, the year his third child, John Junior Howe, was born. I like to imagine this house full of the Howe children. I imagine books everywhere, because all of the Howes were insatiable readers and writers. I'm certain there were many gatherings of friends here, especially those affiliated with their church. Sarah Eva Howe was devoted to her family, both immediate and extended. 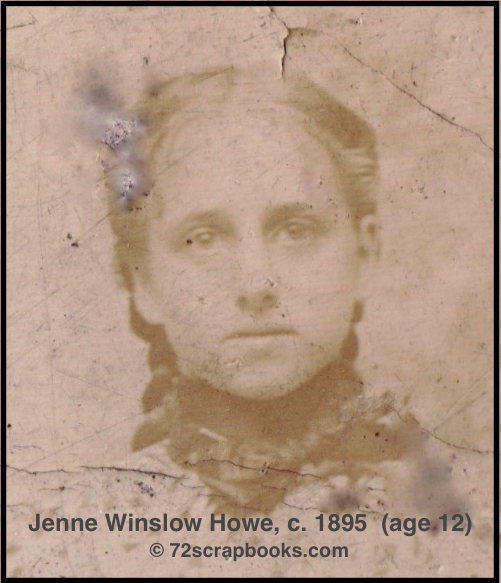 As I look through the scrapbooks, reading her essays, letters, and notes, the relative I see most often mentioned (other than her parents and her sister) is her first cousin, Jenne Winslow Howe. Jenne (to this day remembered as "Cousin Jenne" by Howe descendants) was the daughter of William Ficklin Howe (Sarah's father's brother) and Louisiana "Lou" Winslow Howe. She was born in 1883, the same year as Sarah, so it's easy to imagine the two girls playing together, walking to school together, sharing secrets, giggling about boys. They were in the same grade in school and usually in the same class. 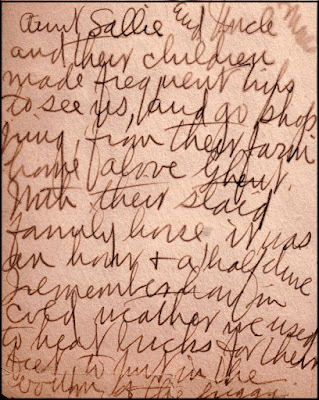 In 1898, when they were about 15 years old, they traveled to Louisville together to visit friends. As my grandmother might have put it, the two girls were "thick as thieves." Jenne, unlike Sarah, completed high school. Apparently, she never married. She lived with her parents on Fifth Street and later Sixth Street in Carrollton, Kentucky. Her brother John J. Howe, an attorney, and sister Lillie M. Howe, who taught across the river at a college for women in Oxford, Ohio, also lived there. I have found no stories or documentation that either of them married. Their father died in 1916, when Jenne was 33. She and her two siblings continued to live with their mother. Jenne's occupation is listed as "none" on the census forms until 1940, when her occupation is "teacher." By then she was 57 years old. I speculate that she was forced into the workplace when her brother died in 1939. He had probably earned a handsome income as an attorney, and Lille's income as a teacher was not enough to support the household. 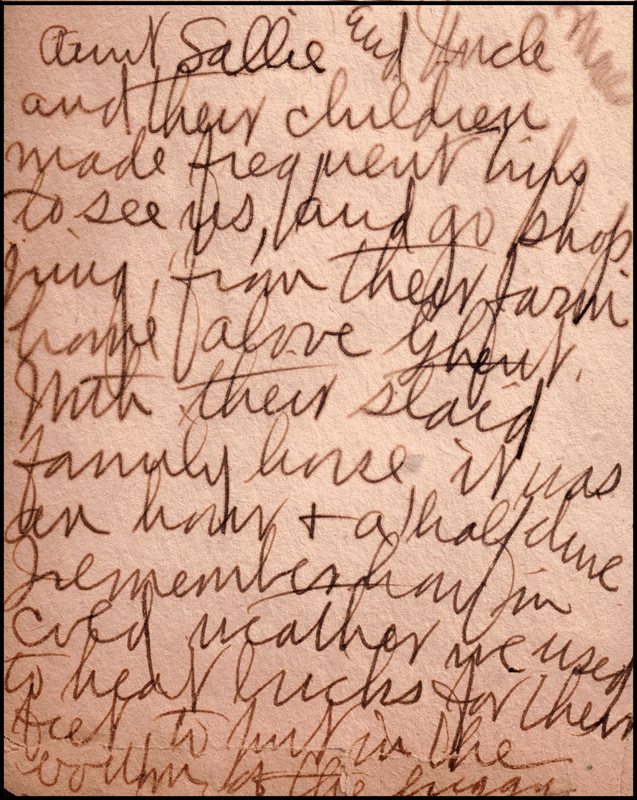 In 1944, when Jenne was 61, her mother died. Two years after that, sister Lillie died. With her parents and her five siblings gone, Jenne was the last of the William F. Howe family. My husband, her first cousin twice removed, remembers visiting Cousin Jenne in Carrollton. He recalls that she was active in her church and community, that she always drove a late-model car, and that her home was nicely furnished. He remembers her being fun to visit. Being a typical little boy, he also appreciated that she liked candy and ice cream and had some on hand to share with him when he visited. Sarah's reference to her Howe cousins would include Jenne and her siblings, the children of her father's brother. Other Howe cousins were either too old or too young or lived too far away to be Sarah's companions. On her mother's Cost side were teen-aged aunts who treated her "like a favorite doll" and young uncles who were close enough to Sarah's age to seem more like cousins. (Read more about that in the post dated September 8, 2016.) So her first cousin Jenne Howe was Sarah's first and favorite playmates. 1 Sarah Varena "Sallie" Howe (1862-1950), sister of Sarah's father; wife of Herman M. "Mack" Froman. 5 Tanglewood Tales for Boys and Girls by American author Nathaniel Hawthorne (published 1853) was a re-writing of well-known Greek myths. Electronic versions of the book are sold on Amazon.com and offered free of charge by Project Gutenberg at http://www.gutenberg.org/ebooks/976. Sarah Eva Howe lived next door to the church. I don't know if that was by design, but the location was definitely convenient. Her parents were "pillars of the church." Both Robert James Howe1 and Alice Ada Cost Howe taught Sunday school classes and were leaders of various committees and groups within the church. Robert was the Sunday School superintendent, as was at least one of his brothers. Alice played the piano and organ, organized the Foreign Missionary Society, and worked on many committees. 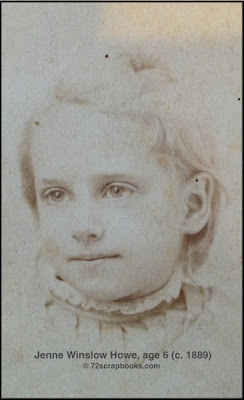 The family's connections with the church go back another generation to Sarah's Irish immigrant grandparents, John Howe and Sarah "Sallie" Brown Howe, who were church members and leaders by the 1850s. 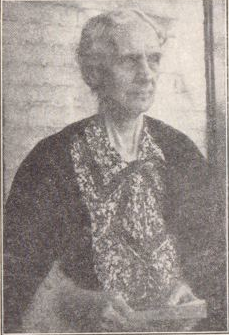 Their eldest son William Ficklin Howe was an active leader of the church, too, and his wife Louisiana Winslow Howe – Sarah's "Aunt Lou" – compiled a church history in 1898. Before that, from 1835 to 1883, Lou's father William Beverly Winslow was secretary of the church's Board of Stewards and kept the records his daughter used to write the history. Sarah herself participated in all of the church's programs for children and youth. When she grew up and married William Levi Salyers, she followed in her parents' footsteps and served the church in multiple ways. She brought up four children in that church. No surprise, then, that she mentions the church often in her scrapbooks. Here is a transcription of one church-related story. I haven't been saying much about the church at this time [1890s], but it was the ever-present factor in our lives – living next door, as we did, every church service was important to us. As Mama had played the organ up to about July before Leonora was born, we even had the big iron key of the church at our house and if someone wanted to get in the church without going clear out to Frank Whiteheads (on Sycamore St. right on the alley from Cousin Jenne's house), they came to us. . . .
Dr. [Robert] Hiner suffered a severe illness during his later ministry; his son Morton Hiner preached for him for awhile, but Dr. Hiner himself was able to preach again during the spring and summer of 1896, and Papa told him Mama was going to have to give up the organ by that time. He was very much perturbed, for he was devoted to Mama's playing. But he himself faced what was to him a bitter prospect – that of being "superannuated"; 2 he preached such a moving sermon before he left from the text "and now I go to Jerusalem not knowing what shall await me there." It was the end of his 4th year at Carrollton; almost all this time his family had lived in the Orr-Lee house (next to Mrs. Rose Baker) instead of in the very antiquated parsonage on 7th street near Seminary, which besides being pretty far from the street was in bad repair. So when Dr. Hiner's successor came and the "Lee" house was not available (as the Orrs were moving into it), the new family, the Shoesmiths, had to live in the old parsonage. It was Brother Shoesmith who soon began agitating and planning for the new parsonage, which was built a few years later. Since writing the above, I have been doing some mental calculations. 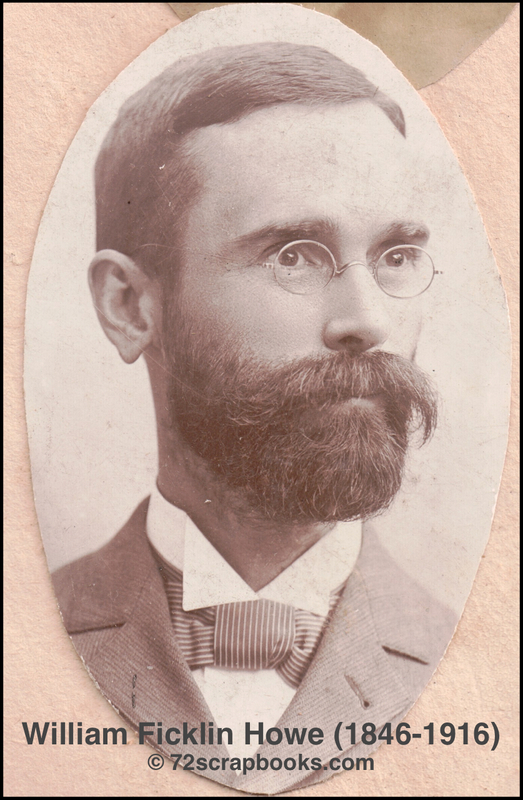 It was in the fall of 1895 that Dr. Hiner left and Brother Shoesmith came to preach. What deceived me was that I knew the Shoesmiths went to school to Mr. English – but at last it came back, Brother Shoesmith only preached for us a year. The next year his family remained in town but he traveled for the American Bible Society, making Carrollton his headquarters. So, in the fall of 1896 Brother Horace G. (Greeley?) 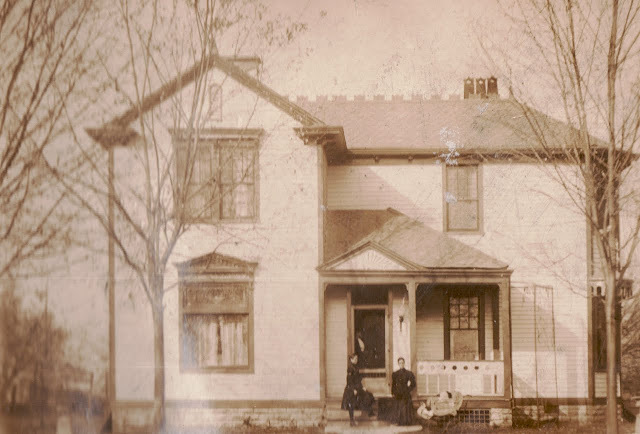 Turner came to preach – he was unmarried but brought his new wife in a few months – they did not occupy the parsonage but boarded at the home of Mrs. Cox in the "Vance house" (across from Uncle Will Fisher's) on 5th Street. The Shoesmiths moved, I believe, to the brick house next to Brother Rowland's now occupied by the Harrisons, on Highland Ave. But the movement for the new parsonage, once started, grew and finally the site was bought, next to Aunt Lou's in what was formerly the big yard where we used to play Hoo hoo and Prisoner's Base. 1 Read more about the role of Robert James Howe in Methodism locally, regionally, and nationally in the "Papa – Robert James Howe (1855-1910)," the post dated August 11, 2016, "
3 Image courtesy Carrollton United Methodist Church, Carrollton, Kentucky. Bits & Pieces: Horse-drawn Hearses, Local Boy Makes Good, and Music, Music, Music! 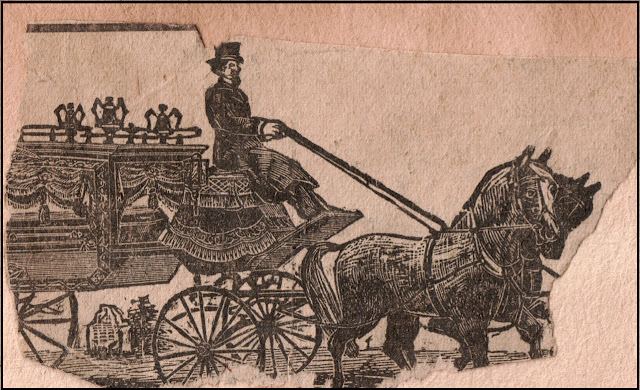 Beautiful hearses and horses with black nets with tassels thrown over them to keep off the flies. Sometimes there were plumes on the horses' heads. Often for a child's funeral there was a white hearse with white horses, etc., but the usual proceedure [sic] was to carry the little baby's coffin (and there were so many then). Major Allen Wyant Gullion was born in Carrollton, Ky., in 1880. After completing his public school education he entered Centre College in 1897 and graduated in 1901, with the Degree of Bachelor of Arts. He was valedictorian of his class and prominent in one of the oldest literary societies. From Centre he immediately entered the United States Military Academy at West Point, where he graduated in 1905. He later served with distinction in the Philippines, Hawaii, Mexico and many parts of the United States. While Commandant of the University of Kentucky, he received the degree of Bachelor of Law, in 1914. He was Judge Advocate of the Third Corps in the World War in France and Germany, and later was Judge Advocate of the Eastern Department and the Second Corps Area; at this time he was stationed at Governors’ Island, New York, and he was at this place from 1919 to 1924. Since that time he has been connected with the office of the Judge Advocate General. In 1918 he received a Distinguished Service Medal for “Exceptional Meritorious and Distinguished services in the National administration of the selective service law from May 4, 1917 to March 26, 1918. He married Miss Ruth Mathews of New Castle, Ky., in 1904, and has six attractive children. At present he is stationed at Ft. Leavenworth, Kan.
Sarah's sister, Leonora Alice Howe (1896-1967) taught piano lessons in Carrollton and scheduled occasional recitals featuring performances by her students. This recital program (undated, of course) provides names of her students and also the titles of songs that may have been popular at the time. The names on the far right of the program identify the composers. Items like this can be gold for researchers trying to place their ancestors in a specific location. The cover of the program gave the date and time – "Friday, May 20th, at 3:00 P.M.," but not the year. Based on the program's placement in the scrapbooks – and considering . . .
this event probably took place in the mid-1920s. 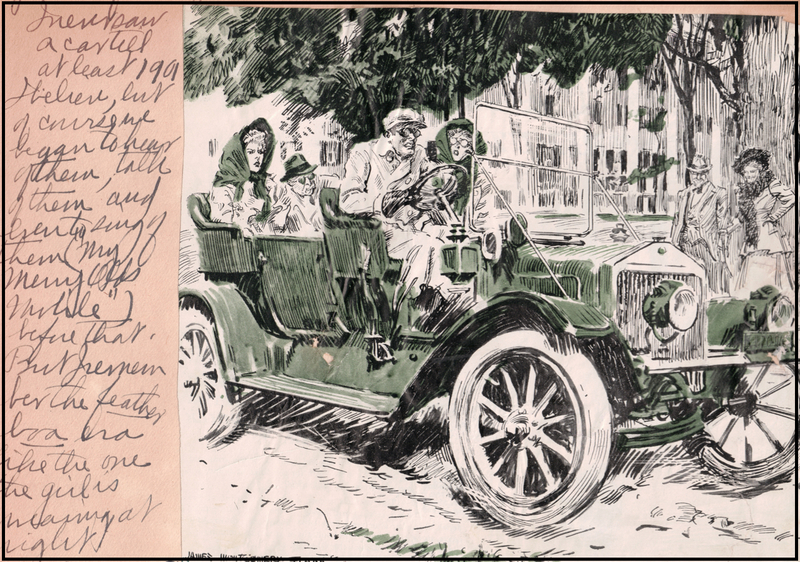 Sarah Eva Howe writes in her scrapbooks about various trips in the 1880s to the early 1900s. She traveled from Carrollton, Kentucky, to Cincinnati to visit relatives and to Louisville to visit friends. Her family went to events in nearby communities of Ghent, Vevay, Madison, and Worthville. Her father and uncles traveled to New York to select stock for the family's department store. How did they get to those places? Clippings and comments in Sarah's scrapbooks tell the stories. Boats – from small rowboats and ferries to large steamships – carried people and goods across rivers, lakes, and oceans. 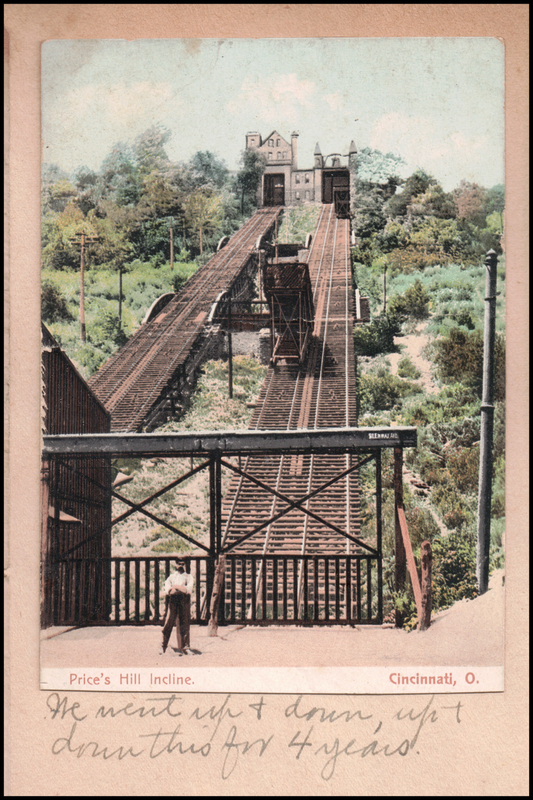 A railroad bridge crossing the Ohio River from Worthville, Kentucky, was completed before 1870, and train travel was apparently commonplace in the entire area before 1880. That contraption on the hillside at the top of the montage is an incline. There was at least one incline in Cincinnati, known as "The City of Seven Hills." Sarah commented about riding it when she traveled by riverboat and needed to get from the river up to Price Hill where her Cost grandparents lived. She saved this postcard in a scrapbook. 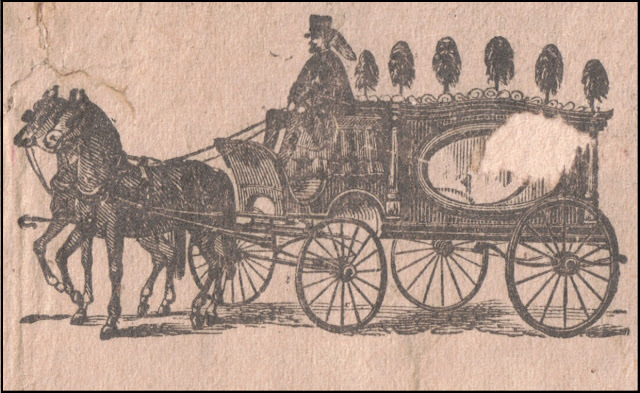 The horse and buggy was a popular mode of transportation for centuries and was still commonplace through the early 1900s. Sarah remembered cousins coming to visit by horse and buggy. Aunt Sallie and Uncle Mack [Sarah Varena "Sallie" Howe and Herman M. "Mack" Froman] and their children made frequent trips to see us, and go shopping, from their farm home above Ghent. With their staid family horse it was an hour & a half time. I remember how in cold weather we used to heat bricks for their feet to put in the bottom of the buggy. 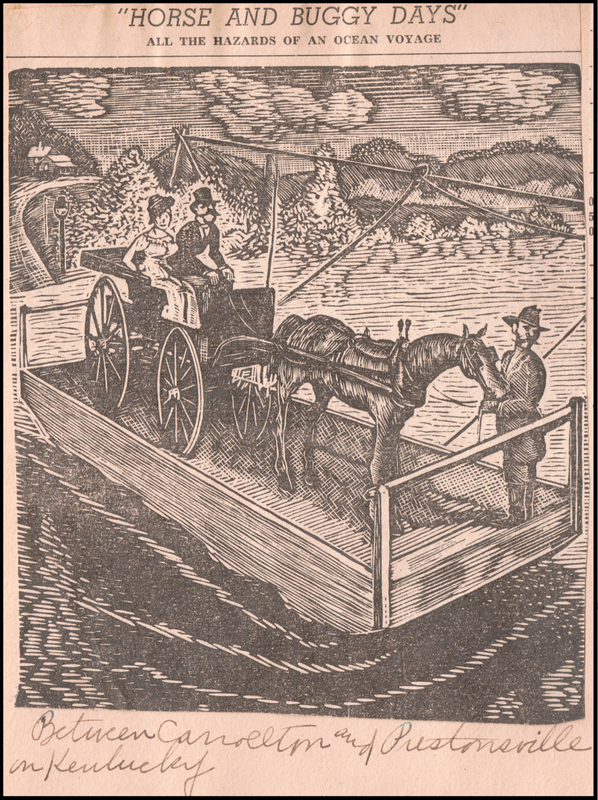 What did people do in those days when they needed to get a horse and buggy across the river? This ferry could do the job. Note the commentary above the drawing: "All the Hazards of an Ocean Voyage." I suppose the most important part for the ferryman was keeping the horse calm! Sarah noted that this ferry operated between Carrollton and Prestonville (both in Kentucky), so these passengers were crossing the Kentucky River just south of where it meets the Ohio. Note their tense body language and apprehensive expressions on the woman's face. 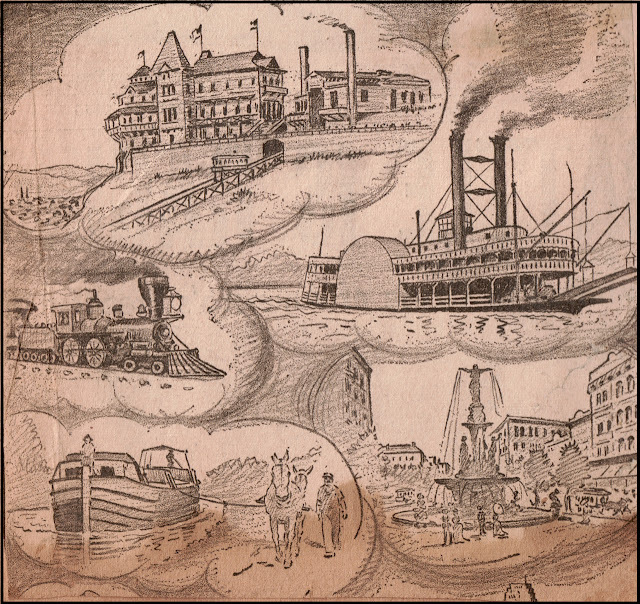 A previous post includes a postcard image and Sarah's comments about Heath's Ferry, which took passengers across the Ohio from the foot of Carrollton's Main Street. Bicycles became popular modes of short-distance transportation in Carrollton – and everywhere else – in the late 1890s. That was about the time the town's residents started hearing about the "horseless carriage." 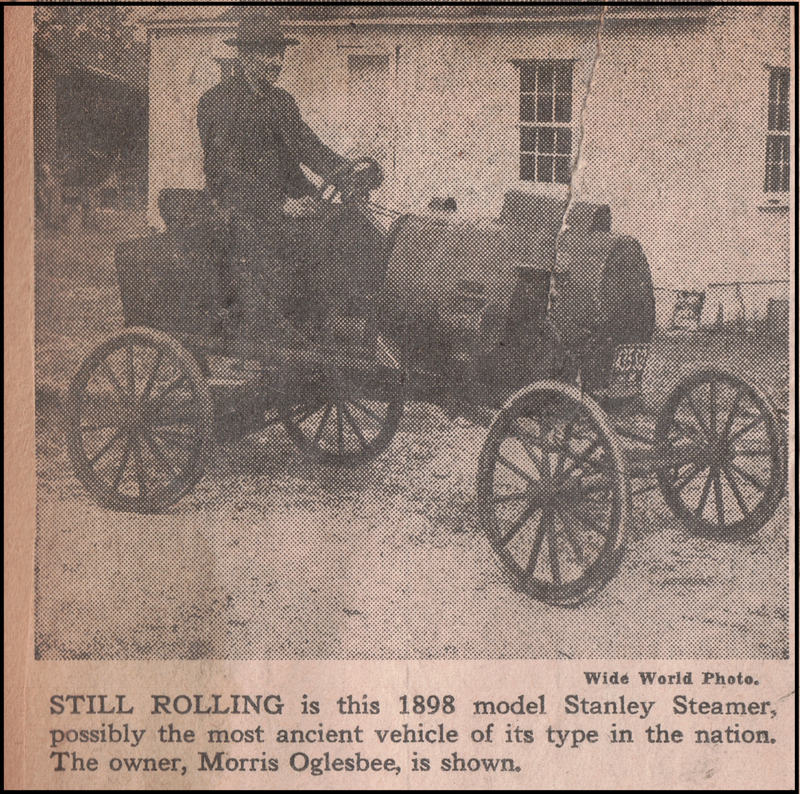 The first image of an automobile in the scrapbooks was this one, an 1898 Stanley Steamer. Sarah wrote no date or source of the newspaper clipping. Later in the scrapbook, Sarah pasted the next image and reminisced about the first time she saw a car. I never saw a car till 1901, I believe, but of course we began to hear of them, talk of them and even to sing of them ("My Merry Oldsmobile") before that. But I remember the feather boa era like the one the girl is wearing at right. The song "In My Merry Oldsmobile" was written and first recorded circa 1905, so Sarah's recollection of singing the song prior to 1901 may be a little off. It's fun to listen to the song recorded in 1906. In 1910, cars were becoming popular enough that the state decided to tax them. Five people in or near Carrollton registered automobiles with the Commonwealth of Kentucky from June 14, 1910, through June 1911. As listed on the Northern Kentucky Views web site, those car owners were Oscar G. Kipping, E.A. Wood, Ida B. Fentress, someone named Schuerman, (probably Henry Berg Schuerman, husband of Sarah's cousin Ruth Louise Howe) and A.W. Shirley. The site lists what kind of car each person had, the horsepower of each car, and the amount of tax paid. As reported in the New York Times, the first phone call ever made from a train occurred along the Carrollton and Worthville Railroad in 1906. Timetable for the L&N Railroad, 1879, listing Liberty (Sanders), Eagle, Worthville, and Carrollton. The site is a treasure trove of information and images about transportation in north and north-central Kentucky during the late 1800s and early 1900s. Now and then, as I turn the pages of Sarah Eva Howe's scrapbooks, I find a departure from family stories. I find genealogy! You've already seen an example in "The Immigrant Ancestors: John and Sarah Brown Howe (June 24, 2016). 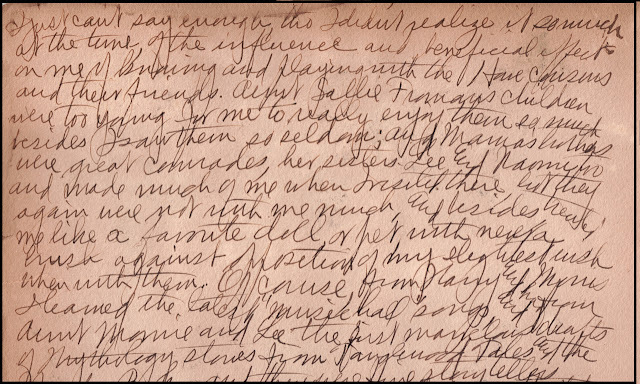 Today I post a handwritten account of some descendants of Sarah's second great-grandparents Daniel Cost and Mary Fisher. The document is on a half-sheet of paper, obviously vintage with multiple fold lines. It offers no clue about who wrote it. It provides no date, either, but there are clues. The latest generation includes Sarah's grandfather Richard Henry Cost, born in 1831, and younger siblings born circa 1852, so the genealogy was written that year or later. Even without offering the specifics we want, this scrap of paper is a treasure and a valuable guide to researching this family. 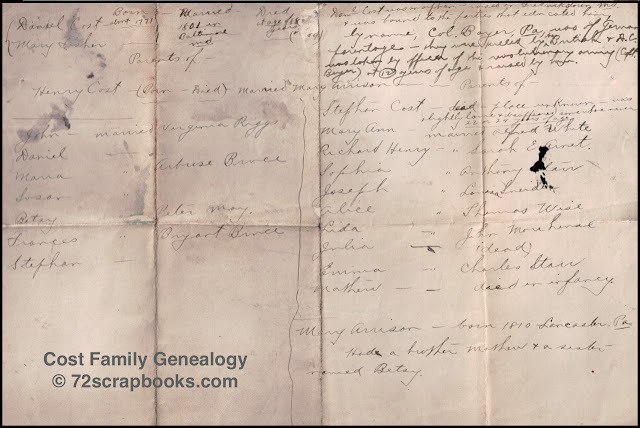 A tip for making sense of the written genealogy: The descendants listed on the left side are the children of Daniel (c1771-1860) and Mary (c1773-1843). On the right side are the names of the children of Daniel and Mary's son Henry Cost and his wife Mary Arrison/Arison. 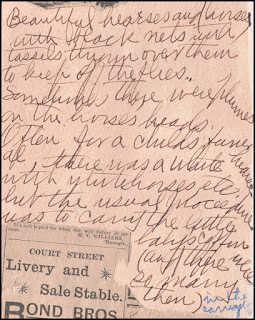 My transcription below the image may be easier to read and follow. 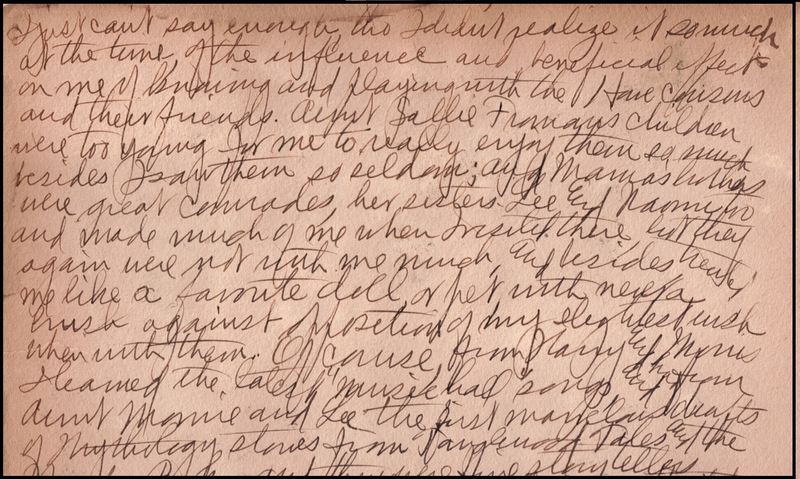 In this transcription, I made best guesses when interpreting the handwriting, and I added a few punctuation marks for clarity. My own comments are in brackets. Daniel Cost born about 1771 – married 1801 Mary Fisher in Baltimore, Md. Died at age of 88 years (or 89). Dan'l Cost was an orphan – raised in Fredricksburg Md. and was bound to the parties that educated him, by name, Col. Boyer, Pa., was of German parentage – they were killed by the British & D.C. [Daniel Cost] was taken by officer of the revolutionary army (Capt. Boyer) at 12 years of age and raised by him. This is the third consecutive post — and the last — focused, at least in part, on the bicycle. 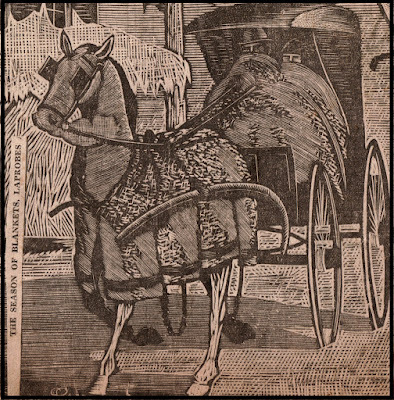 I couldn't leave the topic without sharing about the role bicycles played in the lives of American women in the 1890s and why having a bicycle in 1898 was so significant to Sarah Eva Howe of Carrollton. A bit of history on the two-wheeler: Online sources give various dates for the beginning of the bicycle, but they seem to agree that the first versions of the modern bicycle came along in the early 1800s. A timeline reports that the word "bicycle" was coined in 1869, the same year solid rubber tires replaced iron ones. In 1889, air-filled rubber tires introduced a much smoother ride, which boosted cycling's popularity. Five years later, as technical improvements evolved in bicycle design, fashion designers offered bicycle-riding attire for women, and that made all the difference. Women famous for leadership in women's rights and suffrage began riding and talking about bicycles, and they got publicity for doing so. In the same year, Annie "Londonberry" pedaled around the globe when someone bet $10,000 that she couldn't do it. 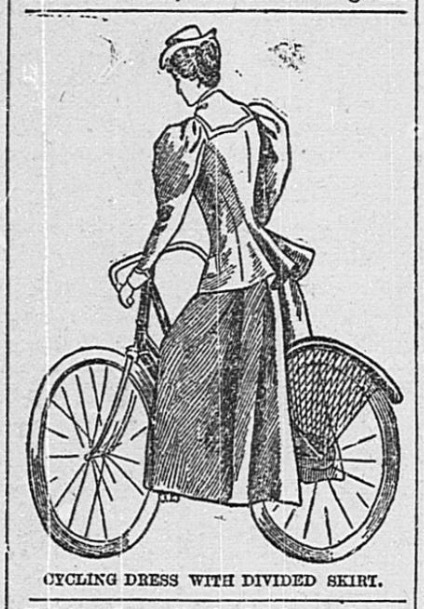 I am amazed at the wealth of available information about the impact of the bicycle on the lives of women in the 1890s, the "golden age of bicycling." The points I listed here don't begin to cover the topic. If you've been reading this blog for a while, you'll understand why I am confident that Sarah knew about these famous women and their thoughts on the bicycle. No wonder she was excited to be given a "wheel" of her own. 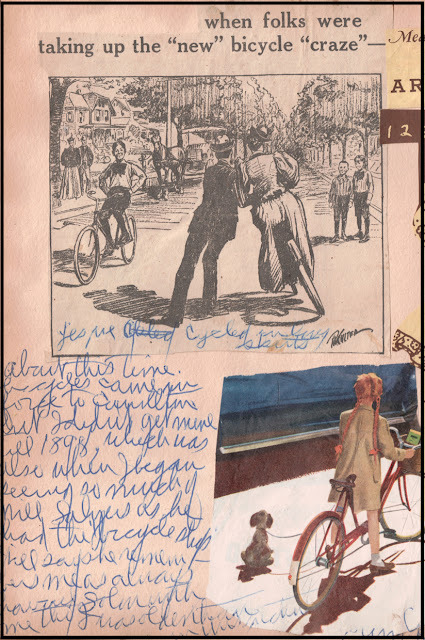 This item from her scrapbooks takes a comical view of women learning to ride bicycles. Sarah mentions riding in long skirts. 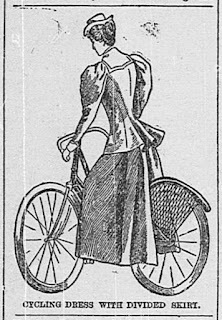 Maybe the new cycling fashions hadn't reached Carrollton yet. Yes, we cycled in long skirts! About this time bicycles came in force to Carrollton, but I didn't get mine till 1898, which was also when I began seeing so much of Will Salyers as he had the bicycle shop. Will says he remembers me as always having Solon [her dog] with me tho I was older than [the girl with pigtails in this picture]. 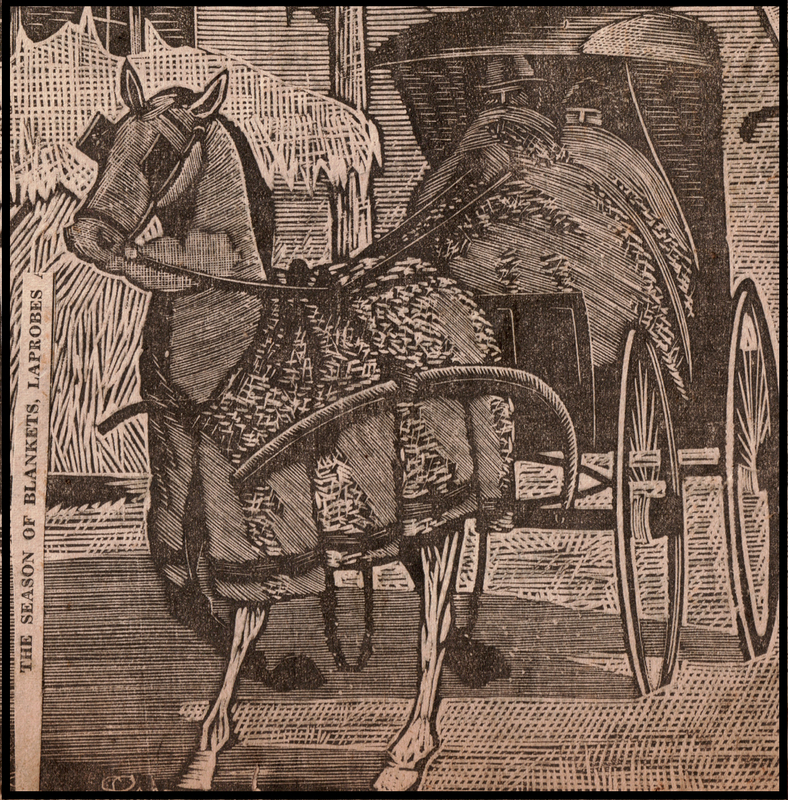 1 An illustrated article, Alone and Awheel From Chicago to San Francisco by Margaret Valentine Le Long, is online in PDF format at the Sports Library & Digital Collection website. 2 Source: Two in the Wild: Tales of Adventure from Friends, Mothers, and Daughters, compiled and edited in 1999 by Susan Fox Rogers; published by Knopf Doubleday Publishing. Accessed 10 September 2016 via Google Books. This book's section on the history of women and bicycles is both informative and delightful to read. 3 Wikipedia.com article "Bicycling and Feminism." Original source: Vivanco, Luis Antonio (2013). Reconsidering the Bicycle: An Anthropological Perspective on a New (old) Thing. Routledge. pp. 32–34.